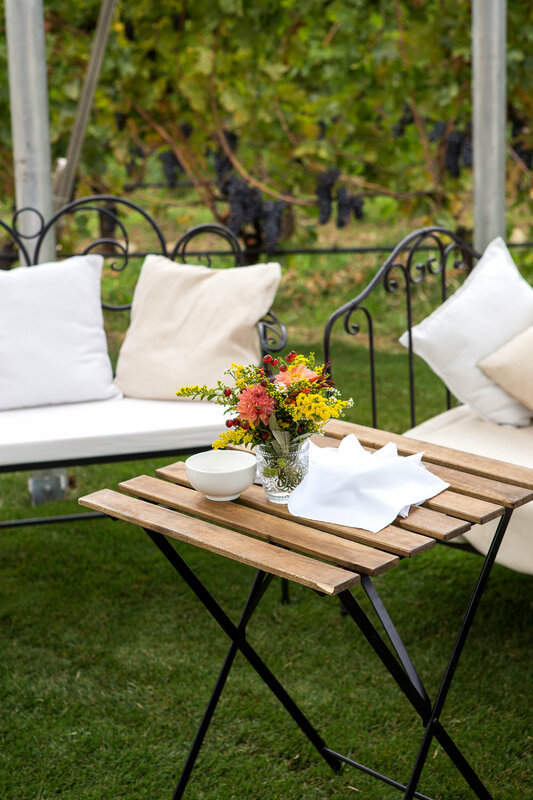 Amidst the vineyards of Valpolicella (northern Italy) the well known Allegrini winery organized an event to showcase the “Fieramento Amarone” wine, "riserva D.O.C.G 2011". I had the pleasure to arrange all the floral decorations. With wine being the main theme I played around with ruby red colours. 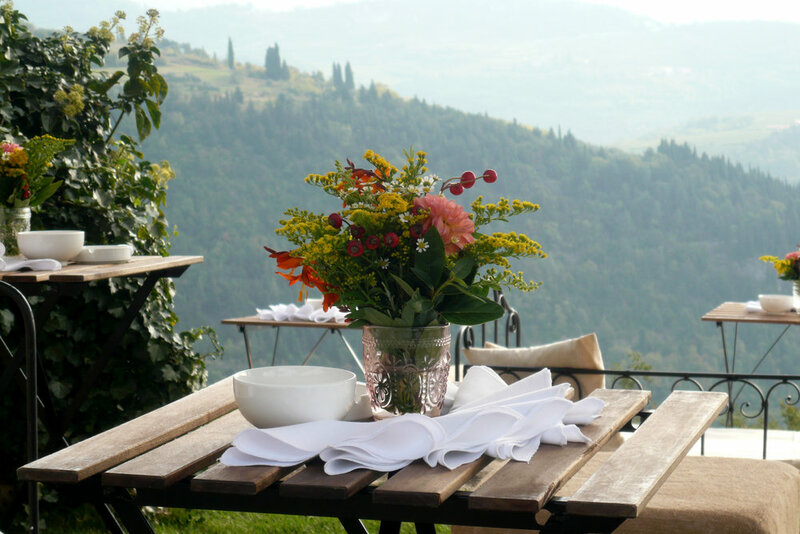 The lunch had a rustic feel about it and was served in the vineyards from where there was a spectacular view of the valley. To highlight the colour of the grapes I picked out yellow, orange and a touch of red. The flowers were: Golden rod, orange Dahlia, and some red berries of rosehip. 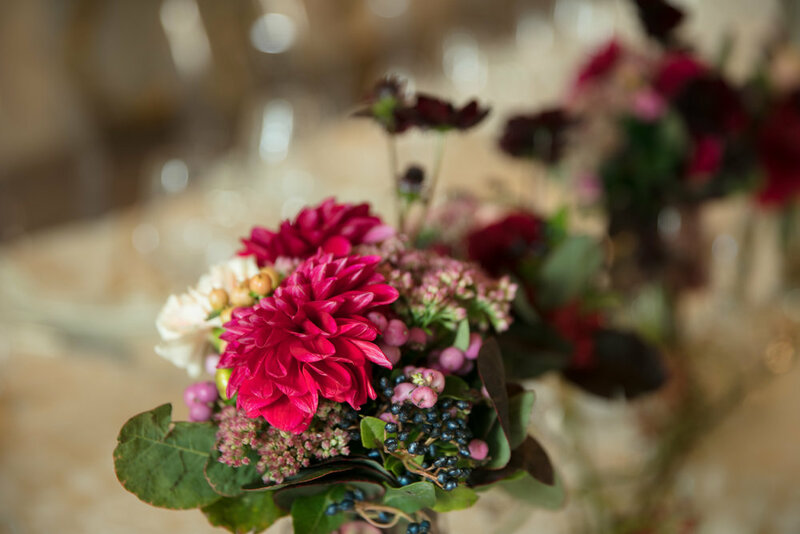 For the gala dinner the bold ruby red Dahlia held pride of place in the floral design of the table. Being September I had the chance once again to accentuate the elegance of the Dahlia with the dramatic intensity of the Cosmos and the violet of the Viburnum berries. To provide a light note I added some peach light carnations. To finish off I arranged the flowers in special wine glasses for the occasion. The cut glass crystal amongst the flickering candles added movement and brightness to the dinner table. The aperitif was held outside where I created an autumnal wood in the stone fountain. I used different types of branches to create a magical fairy like setting. I like to think that tiny fireflies lit up the scene.